Core drilling is the process by which core is extracted from specified places of the concrete slab or wall for doing strength tests. It is recommended to hire professional concrete drilling or sawing company for core drilling or concrete cutting tasks. Hence, if you wish to give a try on your own, here are some tips to help you to become the best choices available and ensure the success of your core-drilling project. 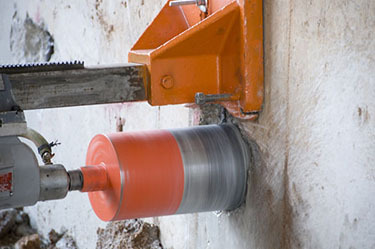 There are different kinds of drill machines available for use on concrete. You may choose to either rent them or purchase them for good. Core handheld drills allow the creation of holes, which are up to a diameter of 3 inches. However, for successful spring testing of concrete you need to drill a hole, which is at least 3.7 inches in diameter. For this reason, you will need to use rig-mounted or drill stand units. For those who are considering the purchase of such units it is necessary to go for multifunction purposes. This way you can ensure the best value for the money spent. You can use them for dowel-hole drilling or electric/plumbing holes. Based on where you need to drill holes specific stands are required. For example, for doing it on slabs having flat surfaces just use vacuum stands that use suction power to keep it attached to the floor. In such cases, you do not need to drill anchor holes. For core drilling in the walls, securing the stand on it is necessary. Presence of safety chains with stands prevent accidental slipping. For powering the core drill one can go for one of the three available options. This includes electric, hydraulic, and air-powered sources. The work environment along with the availability of power on the jobsite determines the type of source ideal for your requirements. Units available in the market allow appropriate speed choices related to concrete hardness and hole-size. Regular core drilling requirements can be dealt with successfully using simple 1-foot long bits. For drilling requirements higher than this, utilisation of barrel bits will do quite well. The barrel bits are bit extensions allowing deeper core drilling compared to the size of existing cutting bits. You can move to increased depths based on requirements, using such drilling extensions. Consider the type of extension you may require for getting the best results in specific scenarios. For choosing the appropriate core diamond bit, users need to consider the aggregate hardness and psi of the concrete surface to be used for drilling purposes. In to get the best effects the core diamond bit needs to be in complete proportion to the drilling material or surface. The basic rule of thumb is that construction workers should use a soft diamond bond for core drilling on hard surfaces or materials. Similarly, they should use a hard diamond bond for core drilling on soft surfaces or materials. There is no single solution available that affects all and one needs to consider their choices based on the current situation and drilling require for ensuring project success.